I appreciate your interest and I'm always willing to be available for an interview. Here I provide press releases, the artist's CV and selected print-quality images of me and my work. The here given informations are only available for reproduction by the press and can be published without fee. If you are an art critic, arts editor, reporter or any other member of the press and you would like to stay informed about forthcoming exhibitions, art fairs and related events, please fill in the form below giving your name, the name of your publication (Firma), street (Straße), postcode (Postleitzahl), city (Stadt), telephone number, email address and leave your message (Nachricht). Alternatively, you also can contact Ditta U. Krebs directely and she will respond you as swiftly as possible. If you need any further information, wheather general or concerning a specific event or work, want to setup an interview with Amador Vallina, or want to use other images of the artist and his work (we can get you images within 24-48 hours of request) , please also contact Ditta U. Krebs - if necessary don't forget to provide your editorial deadline. 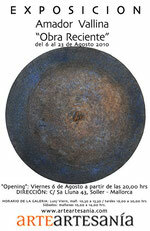 Amador Vallina presents recent works at the gallery ArteArtesanía in Sóller. His main subjects are informel, abstract and non-referential paintings on canvas and paper, but also sculptures of steel, wood and paper. In December the spanish artist Amador Vallina shows paintings, mixed media, monotypes and sculptures in Trier (Germany), Madrid (Spain), Norwich (UK) and Palma de Mallorca (Spain). AMADOR Vallina is a striking character. He smiles a lot, is full of energy and warmth and this comes through in the work he produces. The range of work from prints to sculpture is exciting, considered and unique. The Casa de las Artes-La Galería in Cas Concos, village situated between Felanitx and Santanyí, will hold until September 25 an exhibition by Amador Vallina including paintings and sculptures.